 Several years ago the movie A League of Their Own alerted many Americans for the first time to the existence of the All-American Girls Baseball League, which existed from 1943 to 1954. Johnson's thorough history captures the intensity and Çlan of the league. The author shows how the league progressed from a wartime, morale-building softball league (brainchild of Philip Wrigley, the owner of the Chicago Cubs) to a postwar hardball league, with players just as gritty as their big-league male counterparts. 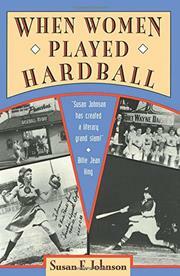 Johnson conducted 26 interviews of women who played for the 1950 Rockford Peaches and Fort Wayne Daisies, the two teams who fought it out for the league championship. As the interviews illustrate, the league stressed ``high moral standing'' and femininity and rigidly enforced its rules by making players attend a ``Charm School'' where they were taught such ladylike things as applying make-up--which they were made to wear on the field. When not playing, the women were kept under the sharp eye of a chaperone. But there were advantages--the women were doing something they loved, and the pay could be very good. The chapters profiling players are reminiscent of Studs Terkel's interview method: direct, informative, revealing. Marilyn ``Jonesy'' Jones, a catcher, recalls her trouble with catching pop flies--and shows the formerly broken fingers to prove it; ``Willie'' Briggs tells how Hall-of- Famer Max Carey made her a successful base stealer and reminds us just how skillful players must be. Johnson also touches on the homosexuality issue (there was some, but, even now, it's a discreet subject) and just how tough some players were: one woman played until she was four months pregnant. This book will be enjoyed not only by the admirers of the All- American Girls Baseball League, but by baseball fans in general.